No insulting users or favorite characters. At 50 sections' I will archive. I will accept friend requests' but I have to get to know you first. No spamming' flaming' or any stuff like that. Put a sig' or use four ~'s. 12 Proposal : Delete Category "Characters who break the Fourth Wall"
37 Username decision:Spiny or YoshiWiki? 39 Do you have Captain Toad: Treasure Tracker? I Updated My Friend Userbox! 27PX This user is friends With BrawlBRSTMS3. I don't mean to come off as rude, but I don't even know you. Hello, I'm Time Turner. That's not what I meant. I've never interacted with you in any fashion other than the recent fourth wall proposal. I'd rather have the people I list as friends be a bit more meaningful. Hello, I'm Time Turner. Please stop creating stub articles on the Super Mario Wiki. This isn't a warning, and it's possible that you made a mistake by accident or without realizing it; this is simply a reminder for your information. If the action continues, then a warning will be issued. Thanks for reading and keep contributing. Proposal : Delete Category "Characters who break the Fourth Wall"
In The Fianal Is Spreading! Did People Look At My User Page? Off the top of my head, I don't know, but I highly, highly, doubt that not a single villain other than Mario has said Mario's name. Hello, I'm Time Turner. I can't decide my new username' help! BabyLuigi64 (talk) I can't nor want to say "pick this name" but if Yoshi's your favorite character, try to think of something that includes Yoshi's name. Think of something no one else has. I did that too when I renamed myself; I remember that night two days ago... Actually, this user simply named "Yoshi" hasn't made any contributions since the summer of 2006, so I think you could just take that if you wanted to and had a good reason. In the end, though, the decision is yours, not mine. Whatever you want. Before saving a new page, be sure that you have put as much effort and information in the article as you can. Make sure that the page follows all of the rules that are outlined in the Manual of Style. Perhaps upload a few images that can be used on the article. Please don't take this notice as a dejection, this is just an informative notice and we encourage you to keep contributing. Help me decide between Spiny or yoshiwiki for my new username! Notice: "Spiny" has reached 3 votes. If you disagree with Spiny, vote YoshiWiki fast because tomorrow the new name will be made. 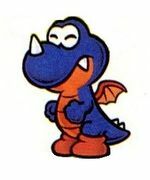 TSUNAMI Because 1) This is MarioWiki, not YoshiWiki (hey, it could exist in NIWA), 2) Some users are named as characters, take User:Mario and User:Baby Luigi as example, 3) I prefer Spiny than YoshiWiki, 4) the username Spiny is free. BabyLuigi64 Hey, why wasn't I told about this!? :P Are Spinies your favorite enemy? Then go with this. Or like I had advised earlier, come up with a creative spin on that name that no one else has come up with, like me. King Dark Bowser Well, I really wasn't around when Spinies made their debut in the original Super Mario Bros., (I wasn't even born then), but Spinies are among my favorite Mario villains. Besides, I'm pretty sure your Spiny, Spike, and my Spiny, Fluffy, would be happy if there was a user who was my buddy who was named after their species. (Fluffy normally is happy, especially when he's playing with coins or Spike.) So, I vote for Joseph to become Spiny. Do you have Captain Toad: Treasure Tracker? Would you like this yoshi egg I found on an island? I hear sounds coming from it. Take it if you want to. Careful, he's a feisty one! Status of August 22, 2014:Just came back from vacation! Status of August 25, 2014:School started for me, so might not be online as long as I was before. Status of August 30, 2014:Will put an edits section on my user page. Status of September 19, 2014:Sorry for being inactive. I had to do school stuff. When I charge my tablet, the charger doesn't work, and I'll get a new one. I'll be contributing from my computer until I get the charger. Status of November 4, 2014:I haven't been here long. I just won't be so active. Status of March 20, 2015:Hey. I've been VERY inactive. I just have so much to do! I also have been on Miiverse too. Status of February 23, 2016:It's been so long since my last time on here. I'll try to become more active. If you want to talk to me where I'm mostly active, try the fourms or Miiverse. Status of May 2, 2016:It's my birthday! Yay! If any of you want to say "Happy Birthday" or something, go ahead! This page was last edited on June 23, 2017, at 19:18.